We celebrated the 25th anniversary of the STIHL® TIMBERSPORTS® Series this year and it was a great one. The world’s best lumberjacks and lumberjills went for gold in the original extreme sport at both the US Championships and World Championships. The US event was held over three days at the Oregon State Fair in Salem, OR. Over 20,000 fans came out to watch 54 athletes compete for the Speed Climb, Boom Run, Collegiate and U.S. Championship titles. Jason Wynyard of New Zealand walked away with his ninth championship title and a brand-new RAM 1500 truck among other prizes. An impressive performance was put in by American Will Roberts, the first former STIHL TIMBERSPORTS Series collegiate competitor ever to advance to the professional Championship round. Roberts, who is from Groton, NY, won the 2005 STIHL TIMBERSPORTS Collegiate Championship and has been a stand out in the professional series ever since. He also qualified as part of the US team to travel to the STIHL® TIMBERSPORTS® Series World Championships. Our World Championships were held Sept. 3-5, in St. Johann Austria. 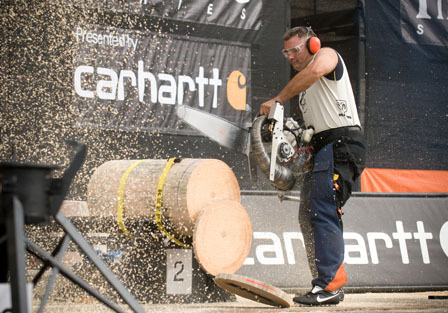 16 of the world’s top choppers and sawyers competed for the 2010 STIHL TIMBERSPORTS Series World Championship title. New Zealander Jason Wynyard took top honors, making him one of the most decorated athletes in the STIHL TIMBERSPORTS Series’ 25-year history. The event also featured a team competition. The U.S. team (made up of Arden Cogar, Jr., Matt Cogar, Dave Jewett, Brandon Sirguy and Will Roberts) was narrowly edged out by the New Zealand team to take home the silver. Logan Scarborough represented the U.S. on an international rookie team. Scarborough sawed a fierce single buck, helping the rookie team set a qualifying time better than half the professional field and advancing them to the second round. His performance made his U.S. pro counterparts beam with pride. The Series begins airing on ESPN2 on October 10. Get the latest information and up-to-date news and video on all the STIHL TIMBERSPORTS Series competitions by going to www.stihltimbersports.com .